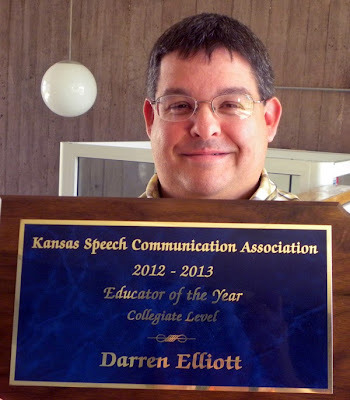 KANSAS CITY, KAN. ---- The most successful debate coach in community college history, Kansas City Kansas Community College’s Darren Elliott has been named State of Kansas Collegiate Educator of the Year. The highest award conferred by the Kansas Speech Communication Association, the announcement of the award was made at the Association’s annual banquet and came as a complete surprise to Elliott. A member of the Emporia State team that won the 1993 Cross-Examination Debate Association (CEDA) national championship, Elliott holds a BA in Communication from Emporia State and a Masters in Communication from Wichita State where he served two years as graduate student assistant coach. * His teams have won at least one national championship at the Phi Rho Pi national championships 10 years in a row including eight Team Policy national titles, three Lincoln Douglas national championships and two Parliamentary national titles. * KCKCC teams have won the CEDA Community College national championship eight of the last 10 years. * This past March, KCKCC became the first community college to qualify two years in a row for the National Debate Tournament (NDT), the only community college in Kansas to accomplish the feat and the first since the early 1980s and just the fifth since 1941. * The 2012-13 team also became the first community college teams to ever win an elimination round debate at the National Parliamentary Tournament of Excellence (NPTE). It was KCKCC’s second straight appearance in the NPTE. * Elliott’s student, Ryan McFarland, became the only debater in the nation to qualify two years in a row for both the NPTE and NDT. * The last two years, Elliott’s teams have been ranked in the Top 10 in the nation among all colleges and universities and were ranked No. 1 in the region this past season ahead of Kansas State, Kansas, Wichita State, Emporia State, UMKC, Missouri State and Johnson County Community College. * Elliott’s teams have won first place Debate Sweepstakes awards numerous times at the community college nationals and several of his debaters have been named CEDA All-Americans, an honor awarded only 30 students from all colleges and universities. However, Elliott’s contributions to debate at both the college and high school levels go far beyond his success at the national level. The Region V Governor for Phi Rho Pi, Elliott has served as president and first and second vice president for CEDA; co-runs the Debate Tab Room Table at the community college nationals; is the Community College representative to the American Forensics Assn. ; and served on the Topic Community for this past year’s NPTE. In addition, he organizes and coordinates the College Policy Tournament hosted each year by KCKCC. Under Elliott’s direction, KCKCC also annually hosts the State High School Forensics Festival for the KSHSAA, the only Tournament of Champions (TOC) debate qualifier in the state of Kansas, a free high school debate workshop each summer and a free high school warm-up debate tourney each May for teams qualified for NFL and CFL nationals. A 10-year member of both the Faculty Senate and College Senate at KCKCC, he has served as president of both Senates; been lead negotiator for the faculty in the last two contract negotiations; and is a member of the College Strategic Planning Committee and former Faculty Development Committee member along with hosting a monthly public debate series on issues effecting local and national politics.